10 Nich verdient (3:23) Silbermond/ Ingo P.
12 1,2,3 (3:16) Silbermond/Weisselberg/Ingo P.
Produced by Ingo Politz and Bernd Wendlandt. 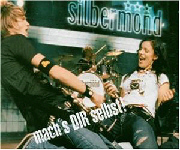 Silbermond is a female fronted pop/rock band from Bautzen, Germany. Mach's Dir Selbst is actually a song titled "Bloodtype R" written by Paul Stanley for his second solo-album. 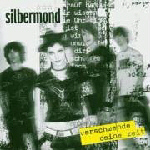 Silbermond recorded the song with their own (German) lyrics for their 2004 album. The song would be the bands first single (and video clip) in March 2004. By early 2004 �Bloodtype R� had been tried out on a somewhat unsuspecting public when it was released as the German band Silbermond�s first single in March. Re-titled �Mach�s Dir Selbst,� it was included on their �Verschwende Deine Zeit� (�Waste Your Time�) album. The German song title is a bit of a play on words roughly translating as �Do It To Yourself,� as in self-pleasuring! The female-fronted pop/rock band�s single entered the German charts at #56 and became the band�s first minor hit. The band�s single also featured a 3:15 �longer rock mix� of the song and was supported by a promo video that featured guitarist Thomas Stolle wearing a KISS T-shirt in honor of the collaboration with Paul. A Dutch girl pop band, Bad Candy recorded the English language original version on their self-titled album released in April 2006: �Bloodtype R is for rebel / You�re in bed with the devil / I throw my fist in the air / What they tell me I don�t care / Call it all stupidity / Well that�s just me.� According to the band�s PR, the song was �Written by the absolute world top of songwriters Paul Stanley and Andres Carlsson. This edgy song represents the rebellious nature of the four girls�.